In England in 2014 there were 6,221 hospital admissions for men aged 40-54 - a rise of 1,961 on 14 years earlier, a Stroke Association study shows. Experts said unhealthy lifestyles were partly to blame for the rise, though the growing population and changes to hospital practice also played a part. 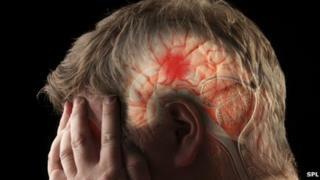 Strokes are caused by blood clots or bleeds to the brain and can lead to long-lasting disability. The majority occur in people aged over 65, and though rates are decreasing in this group, this report suggests growing numbers of younger people are at risk. Experts analysed national hospital admission data spanning 2000 to 2014. Trends for people in their 40s and early 50s appeared to be getting worse. In women aged 40-54, there were an extra 1,075 strokes recorded in 2014, compared with 2000. Experts said growing obesity levels, sedentary lives and unhealthy diets - which raise the risks of dangerous blood clots - all played a part. And they argued strokes among this age group had long-lasting personal and financial impacts on individuals and their families, as well as on the economy. Recovering patients can find it difficult to return to work and should have more support from employers, the report suggests. Jon Barrick, of the Stroke Association, said: "These figures show stroke can no longer be seen as a disease of older people. "There is an alarming increase in the numbers of people having a stroke in working age. "This comes at a huge cost, not only to the individual, but also to their families and to health and social care services." Alastair Morely was 34 years old when he had a stoke on New Year's Day four years ago. Talking to the BBC, he said: "I had an excruciating headache, was being sick, couldn't walk or talk very well." It was was later found that Mr Morely had a heart condition which had triggered the stroke and after his rehabilitation the solicitor had a phased return to work. "It was tough but I was lucky that I was young and my brain remapped around the damaged area," Mr Morely added. Pete Rumbold, from Bromsgrove in Worcestershire, was 49 when he had a stroke in November 2011: "It left me paralysed down the left side, unable to speak, swallow or see." He warned that there were no outward signs he was at risk: "I was very fit, in the gym six days a week and I eat healthily, but I had high blood pressure and didn't know about it." "I hadn't been to the doctor for seven or eight years so my blood pressure wasn't checked for a long time." The Stroke Association said that even younger people should be aware of the warning signs such as dizziness, difficulties with speech and changes in the face. Dr Mike Knapton, at the British Heart Foundation charity, said the increase in stroke rates among younger men and women was worrying and needed to be taken seriously. "These findings also highlight the importance of ensuring your blood pressure and cholesterol are under control, as well as having a health check at the age of 40," he said. He added: "Although there is an increase in sedentary activity and obesity levels now, it is only part of this complex picture." We are getting better at spotting the signs of stroke. And there are now new drugs that can be used to treat people rapidly. The population is rising and this accounts for some of the increasing numbers of strokes. This study provides a snapshot of how stroke rates are changing but no study could account for all the factors that could be responsible. Video How to spot the signs of a stroke?